Last years word was Calm. Boy did I ever have to strive for that one! In 2013, we bought a farmhouse, moved into onto a new foundation, I became my own general contractor, jumped head first into a full renovation, and took on more than ever before, as well as still being Mom and wife. I can't believe that I made it through, let alone that I feel overall, like I actually remained calm. Now I'm not saying I didn't have moments of hysteria and snot faced crying, but generally speaking I feel that I was much calmer in the past year than ever before. I didn't allow myself to dwell on the things I couldn't change. I did my best to avoid being sucked into drama. I lost myself sometimes, and would regroup and try again. This years word is a direct result of last years. I was looking back at how well I did being calm, and looking at my weak points. I didn't even have to think about my word, it just came to me instantly. I am not a patient person. I find myself constantly rushing those around me to go faster. I often take over a task I asked the kids to do, because they're taking too long. I hate waiting, it makes me antsy. 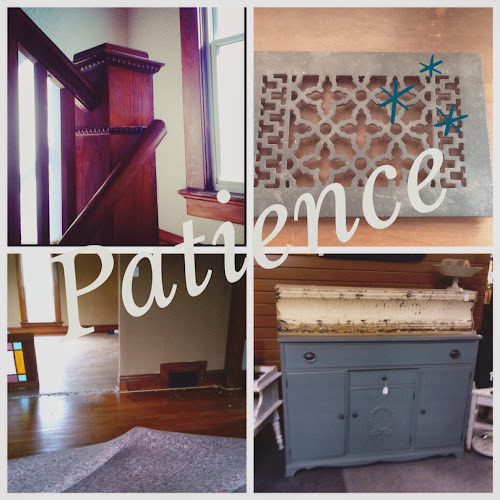 Let's just say patience is not a virtue for me! So this year, I am going to strive for patience. I hope to embrace the moments that are taking too long, and marvel in the tasks my girls can complete on their own, however long it takes them. I think this word will be challenging but I accept that. Here's to 2014 and the road that lies ahead! P.S. Just keeping it real... While adding this photo, my app crashed and I lost the last twenty minutes of work. Patience and calm people, patience and calm.